ORC Week 4 –They’re Up and Fabulous! This is me literally sneaking in under the wire (like less than an hour to still link up over at Calling it Home’s One Room Challenge Week 4). But I wanted to show you what I’ve been up to. So look what I just hung at 10:56 on a Sunday night!! I picked these beauties up from my workroom on Friday and have been dying to see them up! But first I had to spray paint the rod and rings and while I was at it I gave the bamboo bench a fresh coat of Benjamin Moore White Dove as well. As you can see my rug came in and looks great under the game table. I must say that I adore when a company has tremendous customer service. I placed my order for this rug on Bellacor and then noticed that it could take up to 4 weeks to arrive. I shot an e-mail to my sales rep and she was on it and got it here in no time. Thank you Lesa! Don’t worry we’ve got more color coming in over there in the form of bench and seat cushions. I found these two Highland Court fabrics for $10/yard at Fabric Factory Outlet (my go to place when I need something quick). So we’re getting there. Just trying to figure out what I can get done and what I shouldn’t even attempt to start because I’ve got my son’s First Communion next Saturday and a lunch here afterwards!!! Yikes! Don’t forget to check out all of the amazing talent this go around HERE and HERE and I’ll see you here in a couple of days for Week 5! OMG! Kate, they are beautiful! I wish I knew about that fabric store when I lived in NJ. Can’t wait to see more of this room. Those are great! Very pretty fabrics! 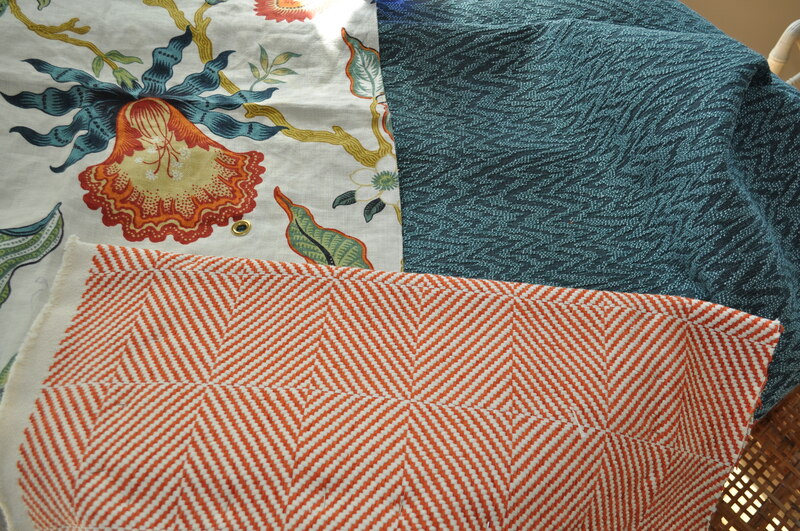 Love these fabrics Kate … and your bamboo bench!! I love your fabric choices Kate! Your space is going to be gorgeous! 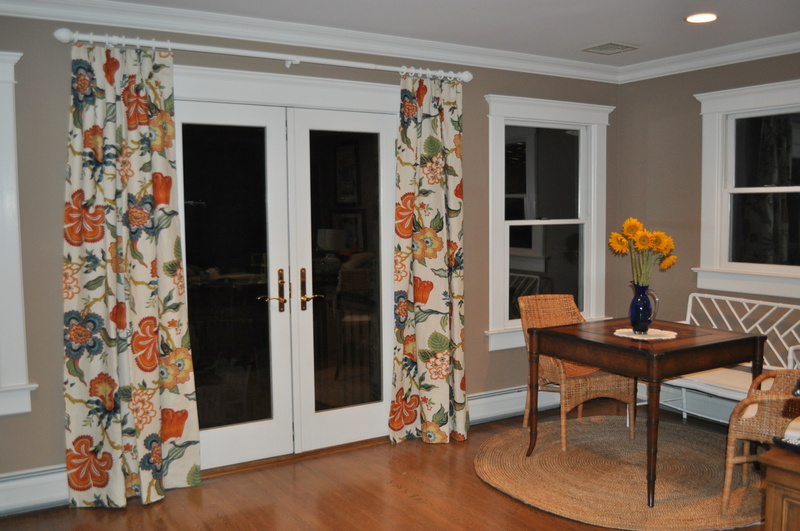 Love those curtains and the other fabrics are beautiful! 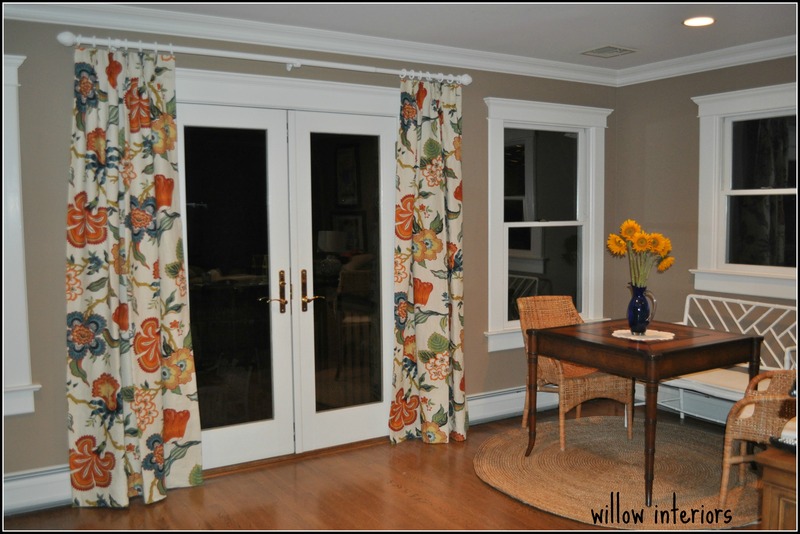 Soooooo loving the fabric of those GORGEOUS drapes! I think I would sit and stare at them for hours after the installation! Great coordinating fabrics, too.